Robbie Cavolina directed this documentary as a promotional tool for the release of the HITS and MISSES albums. It was never released. 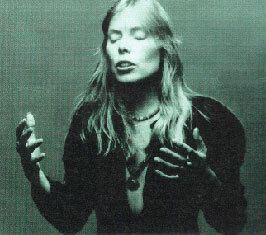 Joni had been vehemently opposed to the idea of having a greatest hits album since she believed most of her work "would be categorized as misses." Her compromise was releasing simultaneously a HITS and a MISSES album, to reintroduce overlooked songs. Many thanks to Robbie Cavolina for permission to share this video for the first time in celebration of Joni's 70th birthday. Really very interesting. When are they going to release the Geffen videos on DVD?? Fantastic promo.